AES is the approved FIPS cipher first published in 1998. AES is included in a large number of encryption products and may be used by U.S. government departments and agencies to protect classified information up to the Top Secret level. Blowfish is a symmetric-key block cipher, designed in 1993 by Bruce Schneier and included in a large number of cipher suites and encryption products. Blowfish provides a good encryption rate in software and no effective cryptanalysis of it has been found to date. .
Specifies the number of passes required during the file shredding process. Increasing this value will improve the effectiveness of the shred process but will reduce performance of any encryption operation. Select this option if you want to encrypt the original filename as part of the encryption process. 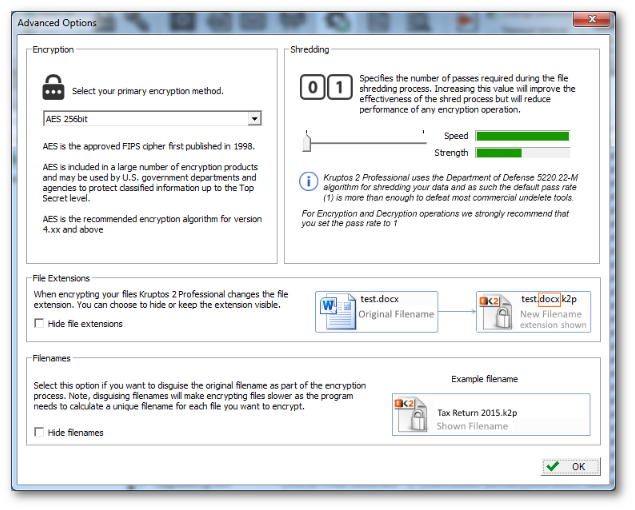 Note, encrypting filenames will make encrypting files slower as the program needs to calculate a unique filename for each file you want to encrypt.